Pictures of the digital mechanical adding machine. The machine now viewed from the front, operator view with the large lever at the right. 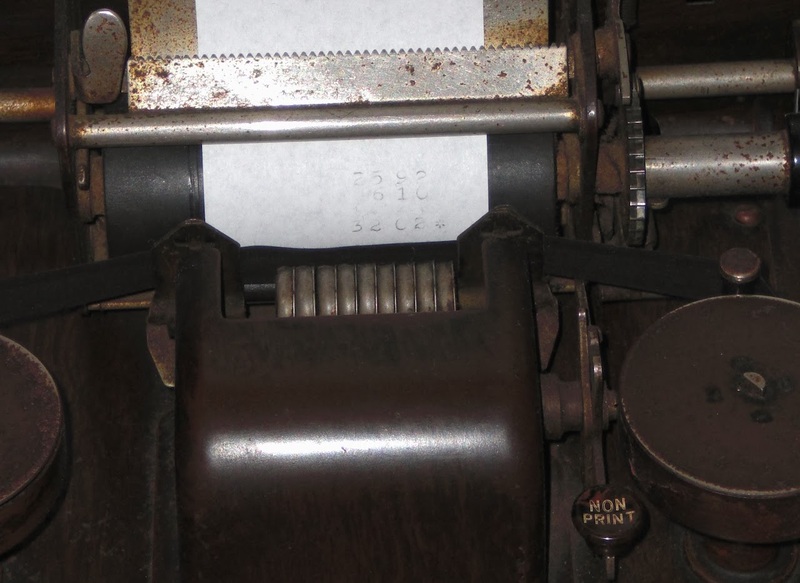 After entering a number, pulling the lever all the way forward enters it into the machine and records it on the paper. The printing mechanism is of the rising segments type, as would I think be fairly common in cash registers and similar machines. 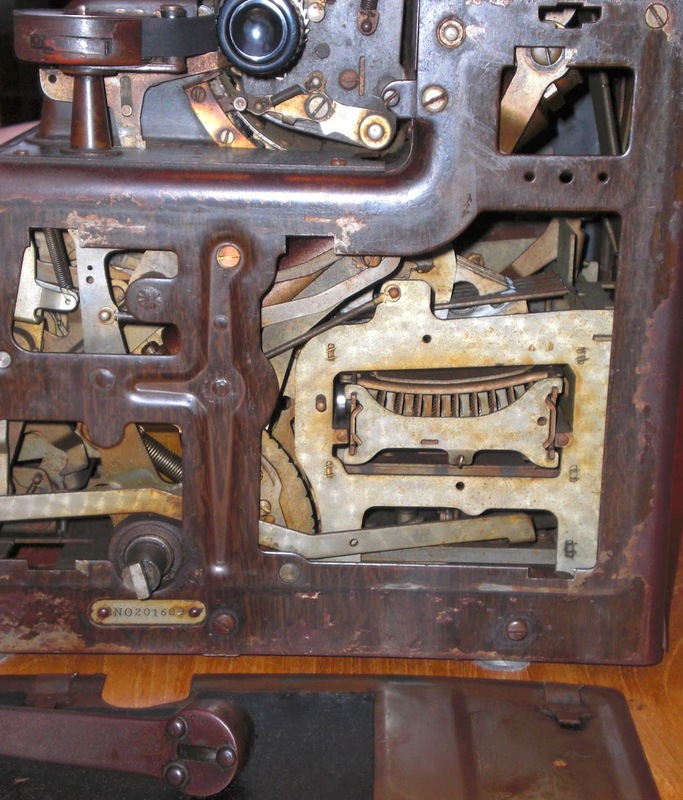 The insides of the machine viewed from the right-hand side. The body panels at the sides come off by sliding forward to unlock. The rear panel comes off also by sliding. This gives access to the main parts of the mechanism. 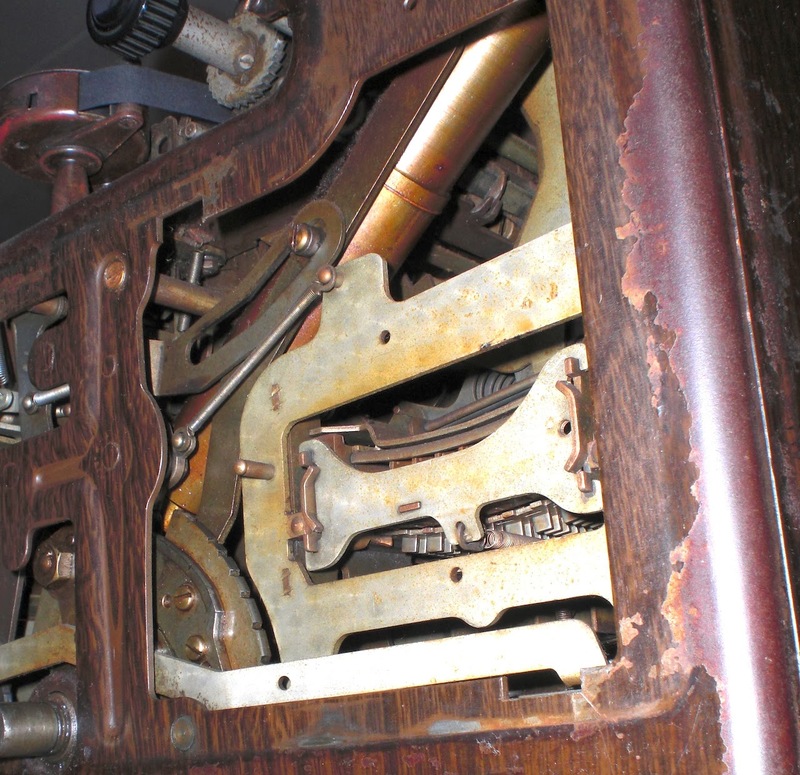 The part that looks like a carriage (it actually is a carriage) surrounded by a frame that takes centre stage in the picture is the number buffer that records the digits as they are entered. When new the mechanism would have been very striking, all shiny and polished with a circular swirl pattern. As digits are entered, the buffer carriage indexes towards the left, to be ready to take another digit in the next decimal position. Here the carriage is moved all the way to the left, the buffer is full. The serial number NO201609 is on the frame below the lever spindle. 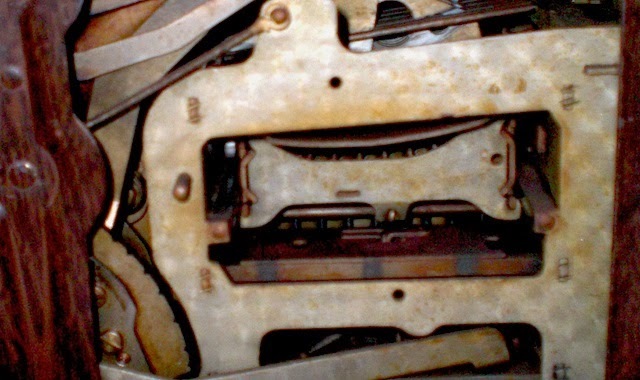 From what I've been able to find on the internet, this serial number is towards the end of the range for these machines making this a machine from about 1926. As the lever needs to be pulled with some zest and force to operate the mechanism, it is quite long and has a large spring and/or dampener as well. This buffer (the large diagonal tube) almost fits inside the machine, needing a cut-out in the top covering. The totals register is toward the top of the machine, almost visible behind the tube. 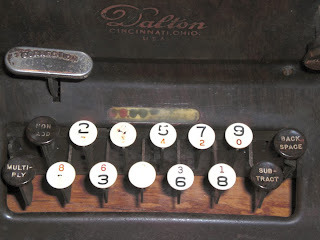 When entering a number on the keyboard, there is a display that shows how many digits were entered. Not the number that was entered, but the number of positions. This is by dots, behind a transparent window (now less transparent than it was when new). Here with 4 digits entered (e.g. 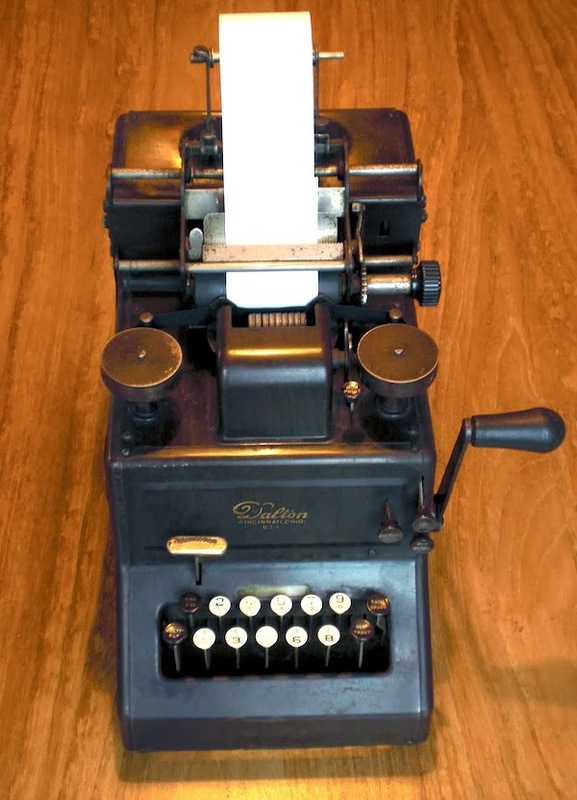 24.95 - the machine assumes a decimal currency format). Here with a full buffer, 8 digits entered. 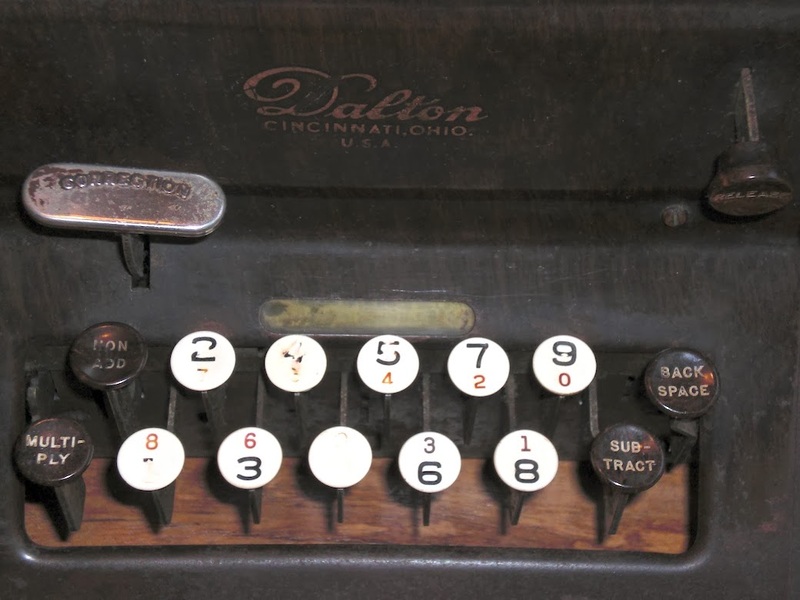 The keys are labeled with the numbers in black, when entering a number to subtract the complement numbers need to be entered. These are labeled in red on the keys. 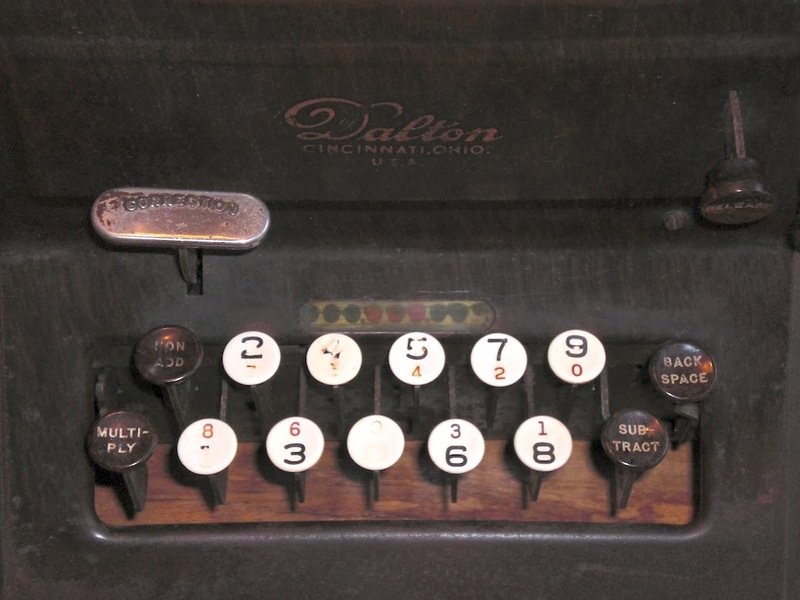 Press down the subtract key to do subtract the number from the total. 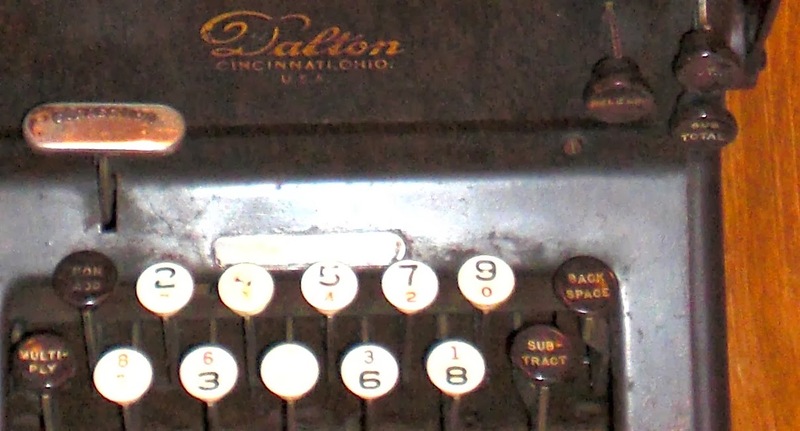 The keys on the front panel of the machine set the machine for doing a total or a sub-total. The sub total does not clear the result buffer when entering the next number, so you can keep adding numbers. One thing that takes a while to figure out with this machine, is that it needs one extra pull of the lever before it is ready to do a total. This adds of course an extra line on the paper (extra paper feed) and I think it is needed to clear and align the mechanism for the printing of the total that is kept in the sum register. Having done one 'enter' without any digits entered, the totals keys are unblocked and can be pressed down. The next pull of the lever prints the calculated total on the paper, the digits are printed with an asterisk behind it to indicate it is a sum. The release key is the 'undo' of selecting to do a total. 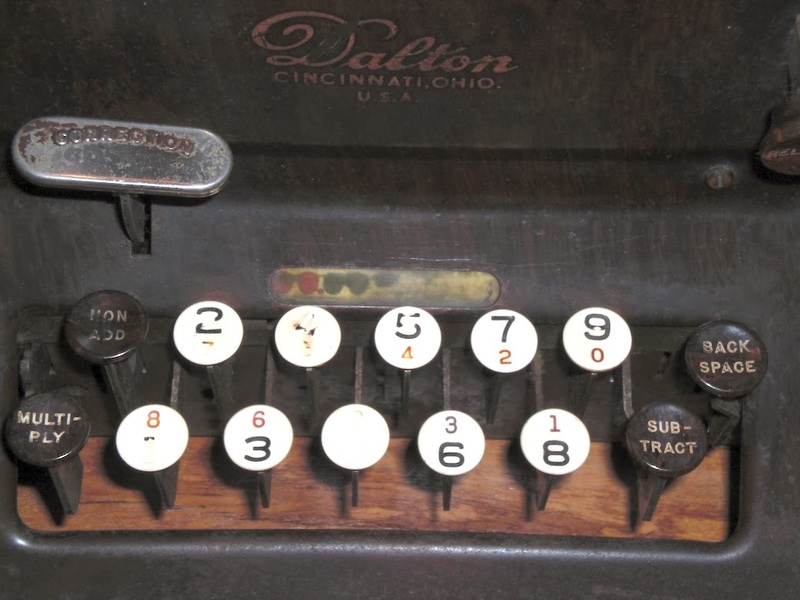 The multiply on the keyboard is a bit of a misnomer, this simply allows for multiple additions. Keep count and pull the lever repeatedly. Pressing down this key prevents the input buffer and the sum-register from being cleared after an addition. 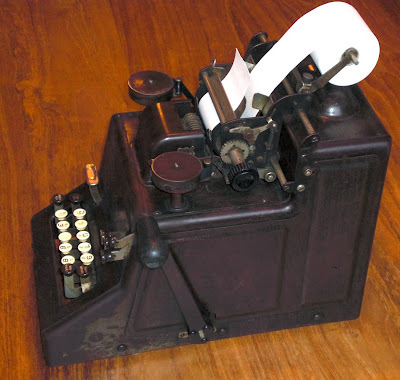 The simple printing mechanism has a key that disables the printing. The printing is actually the only way to read the calculated totals, so that is a bit of an odd option. The printer has 9 segments that slide upwards to select the correct digit. The right-most does not print digits, but the extra symbol to indicate it is a total or sub-total. It really needs a fresh ribbon, but faintly it shows the sum of 25.92 and 6.10 to be 32.02. Probably there's an operating instructions booklet for this machine out there on the internet somewhere, but haven't found any yet. Actually the service and repair manual for this machine should be an order of magnitude more complex and interesting. For now, just hope nothing breaks. I'm a little curious as to how this compares to a Facit adding machine inside. I really know nothing about either except for what you've shown here, though. Wasn't that aware of Facit's machines; think they're pinwheel and the Dalton is a rocking segment. On the local auction site here, usually the Brunsviga type show up (Odhner type) and the full keyboard Burroughs type. Have a look at http://www.w-hasselo.nl/mechn/ for a LOT of info on these machines. This machine's method of subtraction by means of complementary numbers reminds me very much of the abacus, where to add a number larger than the remaining beads on a rod requires adding a single bead on the next rod to the left, while subtracting that number's complement. Mind spinning number crunching stuff. The concept of the buffer and a window to show how full it is is equally mind boggling. Thanks for these photos. Like you said, you wouldn't really be in a hurry to get inside and try and fix one of these monsters.